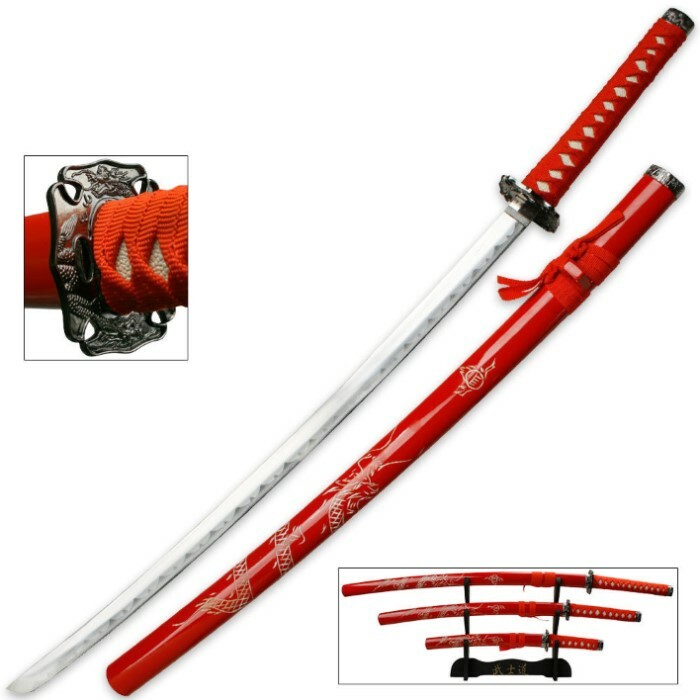 Red Dragon Three Piece Imperial Samurai Sword Collection With Stand | BUDK.com - Knives & Swords At The Lowest Prices! 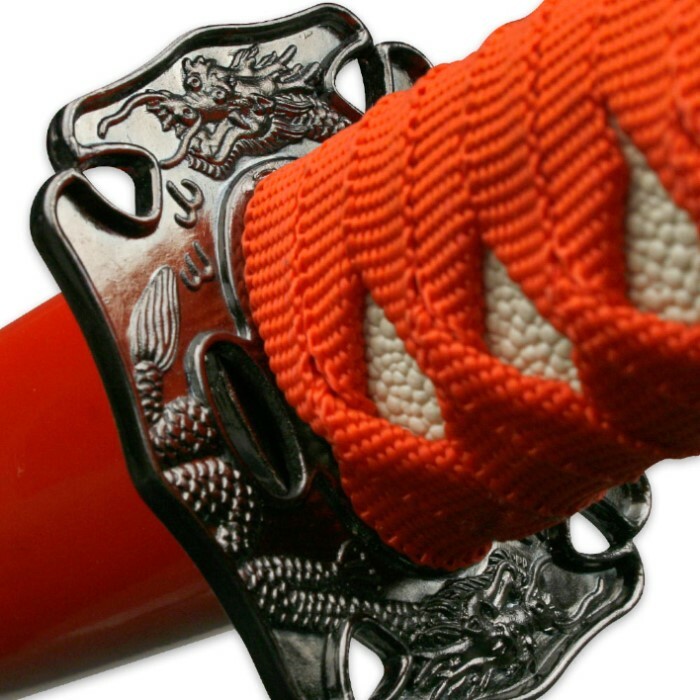 You get three times the samurai glory with this sword collection including a katana, wakizashi and tanto sword. Each one features a stainless steel blade with an imitation ray skin and cord-wrapped handle. Decorative accents like the ornamental tsuba and pommel really dress these warrior-inspired blades up. A hand-painted crimson red wooden scabbard houses each blade in dramatic fashion. A three-tiered stand is included to showcase this collector's edition set. The swords arrived very quickly. 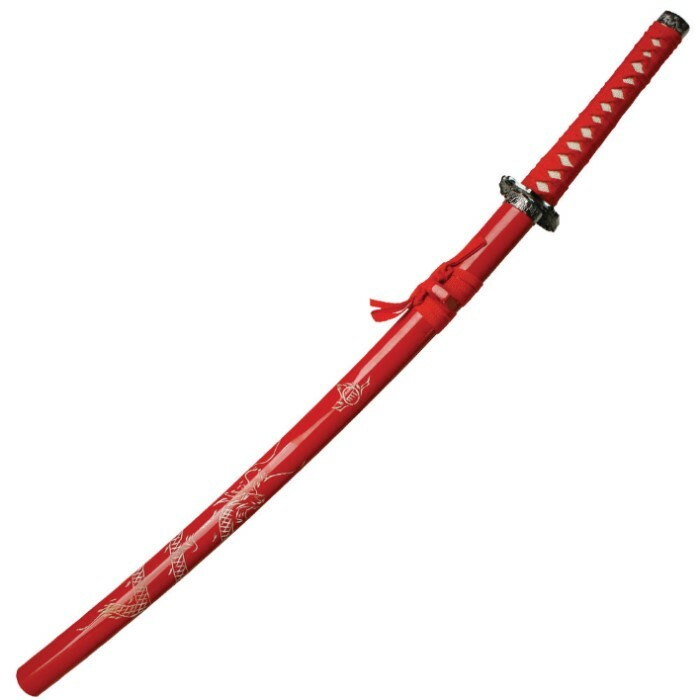 The Katana scabbard came scratch up which takes away from the visual appeal, the sword itself is a little loose. The wakisashi is so loose I'm scared if I swing it the whole thing will fall apart and break something or and seriously injured someone. The Katana and tanto scabbard has a cheap tin and plastic connection that keeps falling of the scabbard. The swords all have a nice weight feel to them, and the handles has a nice decorative touch. None of the swords are sharp. Once set up the whole set looks nice. Overall the 3 swords for $40 is a good deal. This is not my first order and I've been pleased so far with other purchases that I've made. Set was wondeful, arrived very fast. Great buy. Looks terrific. Wasn't expecting much for $39, but I like them. Looks very good where we placed them. Shiney, clean, straight, and sharp enough to hurt you. It's great. Theres a few snamll pretty much unnoticibale nicks and the blade holder of the Katana was a little loose but other then that it was a well worth is buy. I'm definatly going to be making more purchases from here.